Lilias Madeline arrived early on Wednesday the 15th April. A San Francisco spring baby with a raging appetite, legs and arms always on the move, she has won us over completely. Her smiles and giggles are enough to make up for her disdain for sleeping during the day and she never fails to make us laugh with the faces she pulls. Her arrival has meant a return to basics in the kitchen. Meals that can be thrown together quickly, or put together earlier in the day to slowly cook in the oven over hours at a low heat. The first few months it took hours to get her down at night- rocking, feeding, crying (sometimes me as well as her) until finally she was out around 10pm, when we would eat something quickly before falling into bed ourselves. Recently though, I have managed to have her in bed and asleep by 7.30, perfect timing for me to prepare dinner and feel like a normal person. 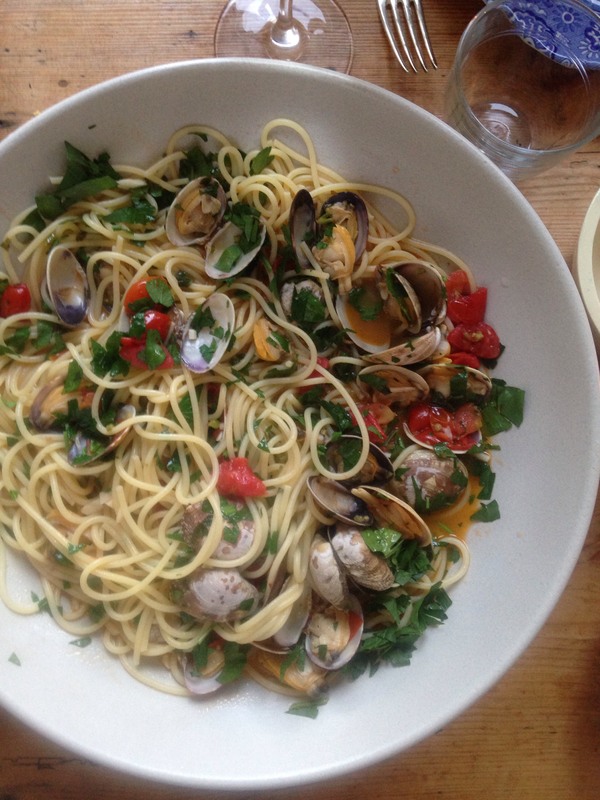 Last night we celebrated a sunny couple of days and a baby who went down to sleep without crying for the first time ever, with a crisp, cold glass of white wine and spaghetti alle vongole. This is a dish I first really had with my friend Marco on holiday in Naples. He told me I had to order it, and so I did. It was divine. This one I made wasn’t bad either. A couple of hours before dinner, put your clams into the sink with cold, salted water. This will clean them and remove any sand. When you are ready to get started, bring a large pot of water to the boil. Finely slice the garlic and parsley stalks, and quarter the cherry tomatoes. (Side note, it is very controversial topic in Italy whether you should use tomatoes in this dish or not. I personally think that the sweet and fresh taste they bring is the perfect compliment to the salty, fleshy clams, but it is up to you.) When the water comes to the boil, salt it well and cook your spaghetti. Now glug a generous amount of olive oil into a pan with a lid. Add the garlic, and fry gently until it has softened. Next add the tomatoes, chilli and parsley stalks and fry for a few minutes. Last add the clams and the glass of wine and put the lid on. It will begin to steam and spit, so give it a good shake so that everything gets cooked. (I was using quite large clams, so they obviously took longer to cook. If you are using the smaller sweeter ones – better for this dish – cook them closer to your pasta being done.) You will know it is done because the clams will have opened and the tomatoes softened and broken down. If any clams do not open, throw them out. Drain the pasta and stir it into the clam mixture when it is still almost, almost cooked so that it soaks up the salty juices from the pan to finish. Roughly chop the parsley and stir through. You are ready to pour a glass of wine, dish up and take a break from reality pretending you are back in Italy on a balmy summer’s evening. Or just a proud mother in San Francisco with a happy, sleeping baby. Oh Anna, I can so relate to all those feelings as I I had one of those babies 31 years ago. so much joy and happiness, but oh such hard work. I really thought I was the worst mother in the world. Olivia showed me a fabulous photo of your little treasure, what a sweetheart. Great to see you blogging again. I think this might be our dinner tomorrow night. I had a couple of nights with Olivia last week having little road trip from Nelson to Christchurch, I loved it. Take care and love to you and your gorgeous family. Thanks so much Nicki, so reassuring to hear. I will send a few photos your way of our little rascal.